Palmetto is a native St. Augustine grass cultivar selected for better color and finer texture than ordinary St, Augustine grass. Palmetto St. Augustine has a nice dark green color with blade widths up to 8mm – 9mm. Palmetto has a soft feel unlike its Floratam and Bitterblue relatives. Palmetto shows excellent fall color retention and spring green up. Palmetto grows in Sandy, Loam, Clay or muck without any difficulties. Palmetto is rated at fair when it comes to wear, however, it does have an excellent recovery rating. Palmetto is selective when it comes to insects and disease control chemicals. Palmetto also has a good weed control rating. Overall, Palmetto St. Augustine can be used for residential and commercial lawns, golf courses and sports fields. 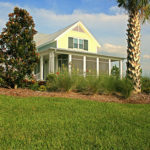 Palmetto is rapidly becoming accepted as a landscaping standard as it has been used in thousands of southern lawns since 1994. Please remember that Palmetto St. Augustine is a living plant, not a miracle grass. When properly maintained it will deliver years of esthetically pleasing and functional lawn. Travis Resmondo Sod is an authorized grower of Palmetto turf. Only turf grass producers licensed by Sod Solutions are authorized to grow Palmetto for sale. All licensed Palmetto production is monitored by Sod Solutions through ongoing quality control and quality assurance programs. Our Palmetto St. Augustine comes in 500 sq. ft. pallets. We have developed a stringent fungus, mildew and foreign vegetation maintenance program to ensure quality, healthy sod arrives at your home. We have a 30-day weed warranty on all of our grasses. Our Palmetto St. Augustine comes in 500 sq. ft. pallets.